at the Vancouver Eco-Fashion Week & LA Fashion Week/Concept Shows. so you can get your little green hands on them. All pieces are of organic/eco-friendly materials. back to made in USA, specifically, back to Los Angeles! I love the look on the face of the fencing model. @MikeB: me too. 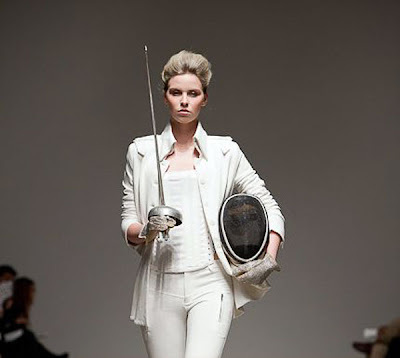 It was the basis for the latest collection; the elegance, balance, strength and precision of fencing/fencers. This is amazing!! Loved it! Great to know that you enjoyed it, Eva! Thank you! !